Unparalleled in design and workmanship, the RCP-1 Pro radio chest harness comes loaded with all the bells and whistles. Perfected over time from customers' feedback to become the most comfortable and functional radio chest harness anyone can wear. Communication is key and the DR-1 Commander will keep all your communication devices in the right place at the right time. The DR-1 Commander comes equipped to hold two BK/800 MHz radios with two main radio holsters on the front plate. The ultimate radio holster for your Bendix King DPH radio. Boltaron plastic formed for excellent protection with a perfect fit. The ultimate radio holster for your Bendix King P150 radio. Boltaron plastic formed for excellent protection with a perfect fit. Perfect way to carry your fire shelter case for dozer operators and those working in and out of vehicles all day. 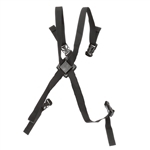 Adapt your chest harness the way you want it. PALS face plate allows you to attach any MOLLE accessory item to this chest harness. Two zipper-close internal storage pockets for tablets, notepads, writing tools, etc. The RP-1 Scout radio chest harness was specially designed for use with a backpack. The perimeter is ergonomically designed to contour any backpack shoulder straps and cut out weight, thus decreasing discomfort and fatigue. A single radio holster that you can attach just about anywhere. The MOLLE Radio Holster is capable of holding the Bendix King down to smaller size radios. 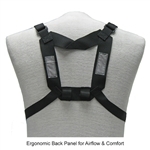 XL back straps for the RCP-1 Pro, DR-1 Commander, RP-1 Scout, or MOLLE Chest Harness. Adds 8 extra inches per strap.